Even though India has one of the largest English speaking population in the world, it still constitutes a small portion of the entire population. 8 out of 10 people still cannot read or understand English language. This is now becoming a huge barrier for people who are newly joining the internet bandwagon in India. This fact is also amply demonstrate by Vuclip’s global video insights survey carried out recently with more than 8,500 users spanning the emerging markets of India, the Middle East, South East Asia and Africa. The survey finds that although movies and television shows account for around 80% of the International content consumed on the Vuclip platform, 78% of Vuclip viewers in India have shown preference to watching content in their native language. Hindi videos constitute over 40% of viewership traffic in India. Videos in languages such as Tamil (8%) Telugu (6%) Bengali (4%) and Marathi (4%) are also seeing increased traction. – Indian want to have an ‘All in One’ mobile video app that can showcase content in viewer’s language. 80% of survey respondents in India said they preferred a single over-the-top (OTT) app for finding both regional and international video content. 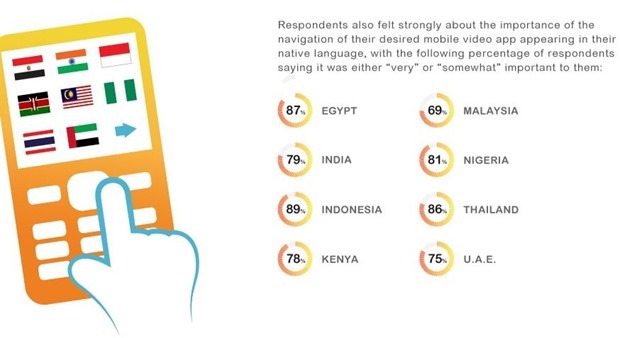 – 79% of survey respondents in India indicated their preference for mobile video apps to enable better video discovery through navigation in native languages. – Thailand (88%) and Indonesia (87%) registered the highest preference for ‘Localized’ mobile video content, while Malaysia (64%) registered the lowest among the markets surveyed. It is clear that local language content demand is huge in India, however, it is quite surprising that very few startups are looking at this space seriously. In our view, the next hot sector which will drive Internet growth in India will be localization.